I am making a game in HTML5, JS. In the game I perform the collisions by circle-shapes since my sprites are rotating. The player has different shapes since it has different sprites when it holds different weapons. The radius of the player is half the sprites width / height. Determine the bounding box of the player-pixels (excluding transparent pixels). Use .getImageData to get the individual pixel data for the image. Examine each vertical column from the left and determine where the first player-pixel occurs. Examine each vertical column from the right and determine where the first player-pixel occurs. Examine each horizontal row from the top and determine where the first player-pixel occurs. Examine each horizontal row from the bottom and determine where the first player-pixel occurs. Now you have top, left, bottom & right bounding values. 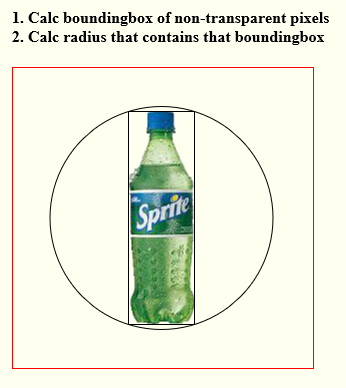 So your containing circle has that calculated radius.